I have a love for photography. My camera has gotten loads of use since I bought it 6 years ago. My daughter was almost one when I purchased my camera and I have been snapping pictures ever since. One thing I love to do is frame the pictures that I take, or make photo books out of them. Another great thing to do with photos is to turn them into canvas prints. I have several canvas prints around my home and each one always gets alot of compliments from visitors. They are so modern looking and always have a classy appeal to them. Personally, canvas prints are some of my favorites. Because canvas prints are customized products, we know there are a lot of expectations that our customers have and we have an excellent customer service team that is available around the clock just to help you get the exact product that you have in mind. The materials we use for our prints are better than or at least up to the industry standards and we can assure you that our customer friendly prices have not come at the expense of quality. Our design wizards are up to any task you have for them, and with a combined experience of well over 25 years in graphic designing, there is no request we cannot fulfill. I was very excited when Canvas Champ offered me the opportunity to review a canvas print, and couldn't wait for my print to arrive. When my package arrived (it came SUPER fast, within a few days of me sending in my picture), I was impressed with the secure packaging. It took me quite a while to get through all the packing tape, and it seemed like they might have used too much. It also seemed like there was no wiggle room between the packing tape and the print so I had to be very careful not to cut my canvas print inside. Once I got through the packing materials, I was able to see the picture I submitted, on canvas for the first time! Isn't it GORGEOUS?!?!? This is a photo from my wedding day and is probably one of my favorites. It was taken at an historical grain mill that was down the road from the house I grew up in. As a young person, I would always see weddings being photographed there and I told myself that one day, I too would have my wedding photographs taken there. And that is just what we did. This particular print is the 12 X 8 size and it is a good size for anywhere I am wanting to hang it. My canvas print has a board backer directly behind the canvas, which is fine. It seems to give it more stability and security. Other canvas prints that I have in my house have just the canvas with no backing...I can't say that I prefer it one way or the other, I just wanted to show you how the back of this print looks. 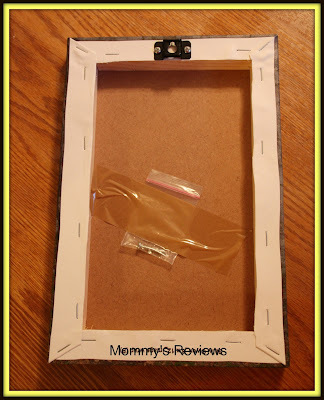 It comes with the picture hanger attached to the frame, as well as a screw to put into the wall. That screw is pretty heavy duty and I am not sure I will use it but it is nice that the print comes with that option. Like I said, the picture hanger is securely attached to the wood frame and seems to be well centered for straight hanging. 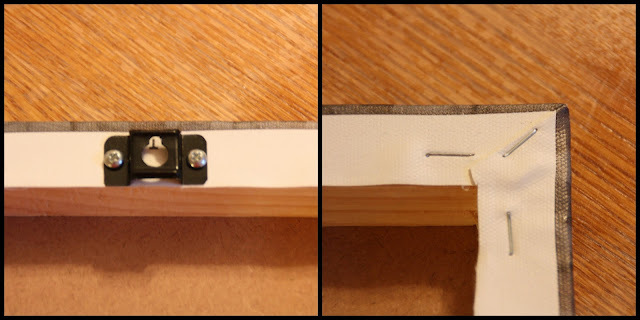 The edges of the canvas are stapled in place, and I thought the work seemed to be very neatly done. 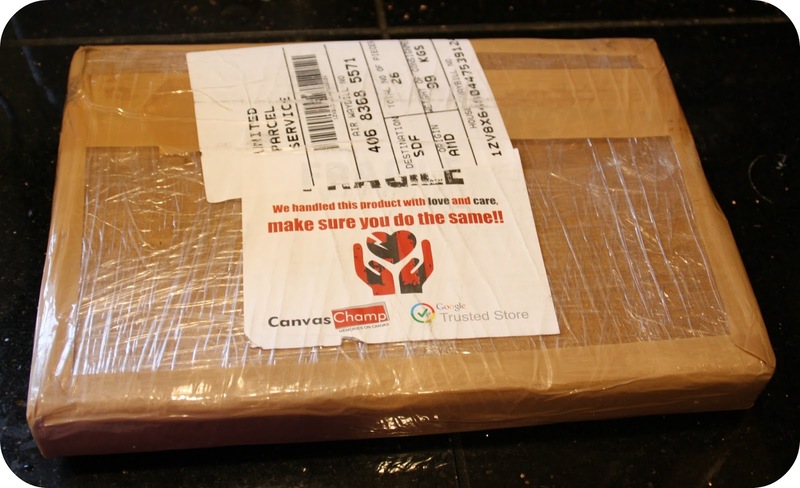 Canvas Champ boasts low prices on their products and I have to say that I do agree with that. This particular print retails for $14.35, which is a great price for what you are getting. I personally love the really large prints that you can buy and with Canvas Champ, you can get a 30 X 20 print for only $36.50! I am definitely going to keep that in mind when I want to get an updated family photo for my living room. I currently have a large canvas print in my living room but the picture is old so I will want to update it eventually. As far as ease of ordering, I haven't gone through the website's ordering system but it seems to be pretty simple from what I have seen. 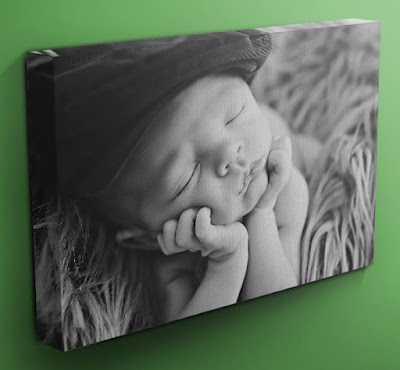 There are four steps to create your custom canvas print and that really doesn't seem all that bad. Upload your picture, choose your size, choose a style and then choose your image options. Seems quite simple. I do know that the customer service representative I was dealing with was very accommodating and helpful when I had questions so I do know that their customer service is top notch. The original print I received came with the Mirror Wrap design and I was not at all pleased with how it looked. They didn't question me at all, and sent a new print that looked amazing. So, if you have an issue with your print, they are super easy to work with and back their satisfaction guarantee 100%. You can find Canvas Champ on Twitter and also on Facebook...they are always having contests and great deals so make sure you follow them so you don't miss out on anything. 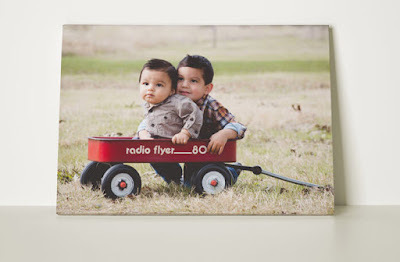 I was very happy with the service and canvas print that I received and definitely recommend them to you for all of your photography printing needs. Disclaimer: I received no monetary compensation for this post. I did receive free Canvas Champ products for review purposes. All quotes and stock photos are from the Canvas Champ website and email. Prize is being provided and shipped by the sponsor. This blog is not responsible for lost, stolen or damaged prizes. All thoughts and opinions are 100% mine. I took a pic of my daughter last week on vacation. It's her whole personality in one pic. I would use it for a photo of me and my siblings. I would use the photo of my husband and myself with our 6 grandchildren from this 4th of July. I would do a photo of my daughters sitting together that I recently took. I would use a photo of my grandpa a few years ago I got one for my granny and it turned out amazing. it was taken in the 40's and he was so handsome. I would want to get a new family picture to put on it! I would use a picture of my four year old grandson seeing his newborn baby brother for the first time. I would use a picture of my two kids at the beach. I would use a family pic we just had done last month. I would use one from our recent family pictures, I would probably do a picture of my two kids together, in black and white. My daughter at Disneyland in front of the Castle. Thanks for the chance. I would use a picture of my newest grandson so that I could give it to my mom, his great grandma, for a gift. I would love this done with a photo of my year old granddaughter wearing a silly hat. I would use a picture of my parents and myself at a family event. A picture of our family trip. A picture of my kids at Disney. I have a photo of our two older kiddos with their new baby brother I would love to have on a canvas! I have a picture we took this summer with all the family over! Has 4 generations! I would love to put that on canvas and hang in the entry way! I have a baby due in the next couple weeks so I'd love to display a new family picture in a unique way. I would use a picture that we recently took while vacationing in the mountains. It would be a picture of my baby. I would use it for a photo of my infant granddaughter. I would make a canvas print using a photo of my grandsons. 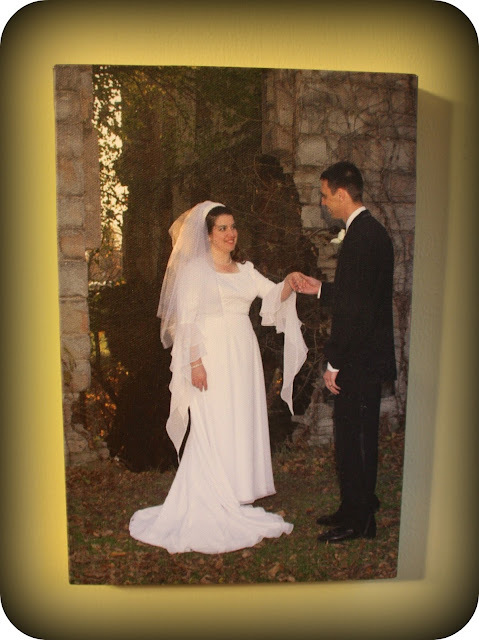 I would put one of our wedding pictures on canvas. It would have to be a pic of my first grandchild (who is almost 7 months old); probably a pic from Easter. I would use a pic of my two girls. 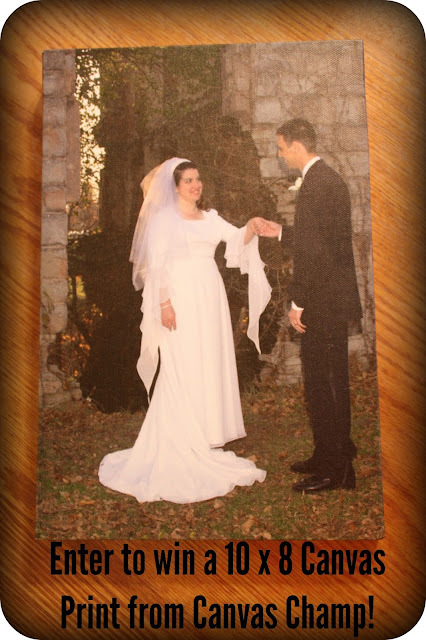 I would use a photo from my parents wedding day. I have a picture of my daughter standing on a rock in a lake fishing. The sun is setting and it just showcases her beauty. Enjoy a Spicier Summer...with Tabañero! FREE Stuff and Deals for Your Birthday!! American Girl Dream Come True Sweepstakes!